CPFI is a registered 501(c)3 organization. Gifts are tax-deductible to the full extent allowed by law. Consult an accountant regarding tax deduction of dues. You can make secure donations using a credit card or electronic bank transfer. To make a single donation of any amount click one of the buttons above. If you would like to become a member of The 1% Group, a special group of members who are helping to support CPFI's ministries by donating 1% of CPFI's annual budget: click here to learn more. To make a lump sum annual donation choose one of the buttons above. If you want to combine your membership dues with a 1% Group gift as a monthly donation you can do that with your membership renewal (Join CPFI) if you are in your renewal period - 30 days before expiration to 60 days after expiration. In the Join CPFI form change your membership type to the monthly option. If you are not in your renewal period this link will not allow you to change your membership type. However, if you email ([email protected]) or call the office (423-844-1043) we can help you make this change. Perhaps you cannot make a commitment to the 1% Group, but you would be willing to join the Power Hour Gift Club. This is a group of working pharmacists, pharmacy students or friends of CPFI that donate one hour of their monthly income: click here to learn more. If you want to combine your membership dues with a Power Hour Gift as a monthly donation you can do that with your membership renewal (Join CPFI) if you are in your renewal period - 30 days before expiration to 60 days after expiration. In the Join CPFI form change your membership type to the monthly option. If you are not in your renewal period this link will not allow you to change your membership type. However, if you email ([email protected]) or call the office (423-844-1043) we can help you make this change. Money, finances, income, profit, interest, bills, payments, debt, interest, stocks, bonds, dividends, and 401(k), 403(b), and 457 plans are terms used daily. Economics is a vital part of each country and within the profession of pharmacy. The importance of money has existed for thousands of years and has not diminished in current times. With the ever increasing number of financial options available and obligations, it is essential that believers understand biblically based financial principles. The greatest source of financial wisdom resides in the pages of God’s inerrant and infallible Word. 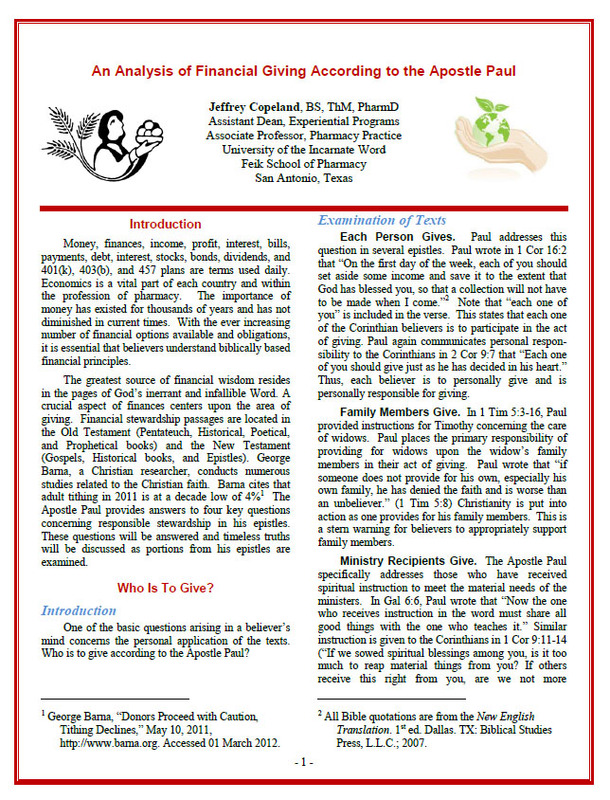 A crucial aspect of finances centers upon the area of giving. The Apostle Paul provides answers to four key questions concerning responsible stewardship in his epistles. Click on the image to access the full article. These questions will be answered and timeless truths will be discussed as portions from his epistles are examined. After examining the texts, it is evident that each person, each family, each church, ministry recipients, and believers gifted with the spiritual gift of giving are responsible for giving. A textual analysis also reveals the reasons for giving are that giving expands ministry, extinguishes needs, exemplifies service, exercises a spiritual gift, expresses grace, expresses love, enables God to release His resources, exalts God, and encourages believers. Believers are to give systematically, consistently, proportionately, cheerfully, generously, willingly, submissively, sacrificially, and sincerely. Results of giving are that giving glorifies God, meets needs, blesses the giver, display’s God’s grace, provides the example for others to follow, strengthens fellowship, and spreads the gospel. Dr. Jeffery Copeland, has written an amazing article summarizing the biblical basis for Godly stewardship that addresses four key questions. Click on the image to the left to read the entire article. Every time you shop at any of 700+ online stores in the iGive network, a portion of the money you spend benefits CPFI. It's a free service, and you'll never pay more when you reach a store through iGive. Participants enjoy iGive's repository of coupons, free shipping deals, and sales. Create your free iGive account. After that, all you need do is shop through the iGive.com/cpfi website, newsletters, or install the optional iGive Toolbar to make sure you never miss an opportunity to raise money when you shop or search online. It’s all automatic, and it's all free of charge. iGive lets you control your membership information with a private password. You can review your store visits and purchase/donation history, and confirm the total amount raised and distributed to the CPFI cause. iGive values your privacy and will never release shopper information without consent. And there are no hidden fees or extra costs when you shop through iGive. Click here for a list of participating online stores.